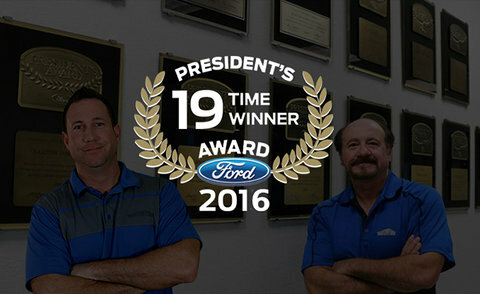 Ford presents the prestigious President’s Award to recognize excellence among their supplier partners. Thanks to the fantastic purchasing experience we provide our customers, we are honored to receive this award for the 19th year. Recognition like this tells us we’re doing something right with how we treat our customers, and it confirms that we are one of the top car dealers in Lakeland, FL. In recognizing our dealership as a top performer, Ford validates our strategy and the way we do business. Our motto is “We’re different, and we prove it.” And with this award, we’re proving it. Out of the 3,000 Ford dealerships around the country, only 10 percent receive the President’s Award. 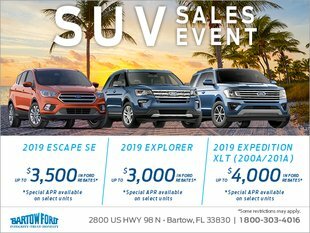 Out of that 10 percent, only 13 of the dealerships are in Florida – and Bartow Ford is one of them. Quality, Green, Safe, and Smart – for dealerships that are leaders in the brand pillars that Ford Motors has set in place. Aligned Business Framework – for dealerships that demonstrate the principles of quality, value, and innovation. Diverse Supplier and Supplier Diversity Development Corporation of the Year – for those that make great efforts to integrate diversity into their team. Gold & Silver – for dealers that outperform others overall. Special Recognition – a category for those who exceeded expectations. Having been recognized as an outstanding dealership this year, and an additional 18 years, is an absolute honor for Bartow Ford. As one of the few Ford truck and car dealers in Lakeland, FL and as one of the elite 10 percent to receive this award, we are beyond proud. Without our more than 200 wonderful employees, and great customers like you, we could not have reached this significant goal. Please visit us and see exactly why we’ve been honored. We are conveniently located at 2800 US Highway 98 N and are open Monday through Saturday.